As a development economist, I’m itching to read Poor Economics, the new book by the amazing Esther Duflo and Abhijit Banerjee. Unfortunately, it’s not yet widely available in UK bookshops. Thankfully, there’s a wonderful visual web version of the book’s key findings, and it’s been reviewed in The Economist and by several UK economists such as Diane Coyle and Tim Harford. These reviews mostly praise Duflo and Banerjee for demonstrating just how much development economics is now subjecting itself to more and more rigorous testing – something the medical profession, for example, is renowned for. So, given my delay in reading the actual book, I decided to test for myself whether the reviews were right. I found a perfect DFID paper for the task. It was published just a few weeks ago by the team I work in, and synthesised evidence from all over the world on “cash transfers”. 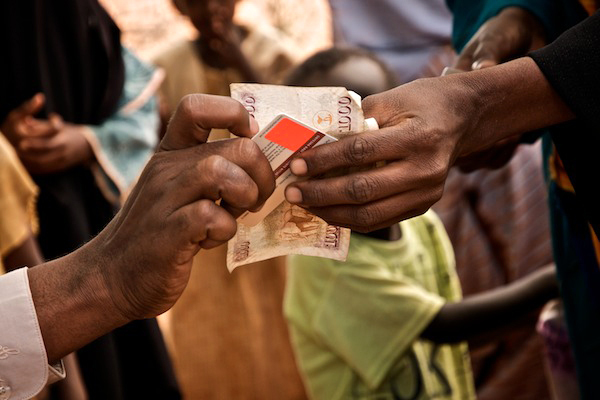 “Cash transfers” are when cash is directly handed to needy, often destitute, recipients. Some transfers are “conditional” – which means the recipient actually needs to do something to receive the money, such as making sure their child attends school or sees a doctor once a year, but other cash transfers can be “unconditional”. DFID is planning to work with 16 developing countries to design and implement cash transfer schemes, to help lift recipients out of poverty. As I worked through the DFID paper, I realised that economists have found a great deal of evidence on how cash transfers help the poorest get food, education and assets, and therefore adapt to and become more resilient to climate change. But my profession has, regrettably, not been testing two other climate change related questions. First, we don’t seem to have gathered much evidence on whether cash transfers might help the poorest access energy or transport. Together, according to the International Energy Agency, energy and transport currently account for almost 60% of CO2 emissions in developing countries, and their emissions are projected to grow fast – unless clean technologies become cheaper. But these sectors also make a huge difference to people’s lives. Without electricity and transport it’s hard for children to receive education, hard for clinics to run and maintain life-saving equipment, and for people to get to markets and set up new businesses. If we were to collect evidence on whether cash transfers do help the poor access energy or transport, we could look at whether to design the transfers specially to accelerate the uptake of cleaner options. We could also check whether it’s most cost-effective to help poor people get access to clean, low-carbon energy by creating new specific programmes, like Feed-In-Tariffs or Advance Market Commitments, or by simply using cash transfers. In this way, more evidence could help us broaden the range of development tools that help address climate change – perhaps. Second, we’ve not yet systematically examined the experiences that developing countries have had with using cash transfers to grow and take action on climate change. Our paper didn’t mention that Indonesia, Yemen and several other developing countries have been using cash transfers to compensate poor communities at the same time as removing expensive and harmful fossil-fuel subsidies – such as on oil, coal and kerosene. Without cash transfers, the removal of these subsidies could have stimulated fuel riots – of the kind currently being experienced in Uganda and China. If HSBC’s Chief Economist is correct in saying fossil fuel prices will continue to rise, subsidy reform will become even more crucial globally over time. Cash transfers are clearly crucial for solving a lot of problems in developing countries. My hope is that we will be more creative and experimental in gathering more climate-related economic evidence from cash transfers and other popular development tools. This will help developing countries plan even better for the long-term, and seek stronger complementarities between climate change, growth and poverty reduction – what many are calling “green growth”. I hope too that top development economists like Duflo and Banerjee will join us in doing so – the climate just won’t wait!